This article explores quanta as an emergent phenomena resulting from the slow-down of the speed of light from a native state of infinite speed to c. As a result of this slow-down, properties implicit to light in its native state ‘accumulate’ as quanta as it were, in order to allow such implicitness to express itself in a state of material diversity. 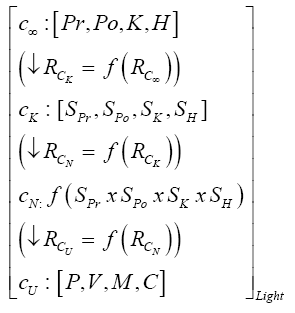 The section of ‘Symmetries of Light’ proposes a mathematical process by which light at its native state symmetrically transforms to become light at c. In the process implicit properties diversify to sets of related properties, whose elements combine in various ways to practically become an infinite set of unique seeds. The section on ‘Quantization of Light and the Emergence of Space, Time, Gravity, and Energy’ explores different kinds of quanta, and also suggests that space, time, gravity, and energy are themselves emergent and dependent on light. In fact space is suggested as being the field in which unique seeds exist, time as the experience related to the maturity of the unique seeds, gravity as the inter-relation between the seeds, and energy as the process by which seeds materialize. The section of ‘The Composite Fourfold Quantum’ applies the proposed space-time-gravity-energy quantum to a series of possible circumstances. The first four are more “normal” circumstance: at the atomic-particle level, at the unit-space level, at the level of a Big Planet, and in an Expanding Universe. The remaining circumstances are related more to the Theory of Relativity: as a particle approaches the speed of light, at a Black Hole level and when a Cosmic Bounce occurs. As explored in ‘Symmetries of Light and Emergence of Matter, the speed of light has significant implications on the experienced nature of reality. The finiteness, c, at 186,000 miles per second, creates an upper bound to the speed with which any ob ject may travel also implying that objective reality will be experienced as a past, a present, a future from the point of view of that object. These characteristics – a past, a present, a future – are implicit in the nature of light and become part of objective reality because of the speed of light . Further, c also creates a lower bound when inverted (1/c) being proportional to Planck’s constant, h, that pegs the minimum amount of energy or quanta required for expression at the sub-atomic level . Planck’s constant, h, therefore allows matter to form Lorentz  and for the reality of nature with a past, present, and future, to also be experienced as phenomena of connection between seemingly independent islands of matter. This characteristic of ‘connection’ is therefore also proposed to be implicit in the nature of light and becomes part of objective reality because of the speed of light. But a ‘past’ can also be viewed as established reality as defined by what the eye or other lenses of perception can see. Such lenses see what has already ‘physically’ been formed in time. A ‘present’ implies the working out of the play of forces and suggests the ‘vitality’ of nature where the most energetic or powerful force will express itself over others. A ‘future’ implies the notion of a cause, or seed, or direction, and suggests the ‘mentality’ or meaning that perhaps drives the emergence of phenomena . Current instrumentation, experience, and normal modes of thinking having developed as a bi-product of the characteristics so created in the layer of reality U may be inadequate to access N without appropriate modification. The notion of wave-particle duality already challenges the notion of normal thinking perhaps because wave-like phenomena is a function of faster than c motion and particle-like phenomena is a function of less than or equal to c motion. That these may be happening simultaneously is reinforced by principles such as complementarity in which experimental observation may allow measurement of one or another but not of both . But then taking this trend of a possible increase in the speed of light to its limit, this will result in a speed of light of infinite miles per second. The question is what is the nature of reality when light is traveling at infinite miles per second? In any spacetime continuum light originating at any point will instantaneously have arrived at every other point. Hence light will have a full and immediate presence in that space-time continuum. Further, that light will know everything that is happening in that space-time completely instantaneously – that is know what is emerging, what is changing, what is diminishing, what may be connected to what, and so on - or have a quality of knowledge. It will connect every object in that space-time completely and therefore have a quality of connection or harmony. Finally nothing will be able to resist it or set up a separate reality that excludes it and hence it will have a quality of power. But it can also be noticed that ‘physical’ is related to presence, ‘vital’ is related to power, ‘mental’ is related to knowledge, and ‘connection’ is related to harmony. The question then, is how do these apparent qualities at ∞ precipitate or become the physical-vital-mental connection based diversity experienced at U? This may be achieved through the intervention or action of a couple of mathematical transformations. First, the essential characteristics of Presence, Power, Knowledge, Harmony that it is posited exist at every point-instant by virtue of the ubiquity of light at ∞ will need to be expressed as sets with up to as many as infinite elements. Second, elements in these sets will need to combine together in potentially as many as infinite ways to create a myriad of seeds or signatures that then become the source of the immense diversity experienced at U. This suggests that all that is seen and experienced at U may be nothing other than ‘information’ or ‘content’ of light and as such that there are fundamental mathematical symmetries at play where everything at U is essentially the same thing that exists at ∞. The unique seeds are therefore a function, f, of some unique combination of the elements in the four sets. The matrix suggests a series of transformations leading from the ubiquitous nature of light implicit in a point – presence, power, knowledge, harmony - to the seeming diversity of matter observed at the layer of reality U which is fundamentally the same presence, power, knowledge, and harmony projected into another form of itself. This is suggesting that the reality at the layer specified by the speed of light is a function of the reality at the layer specified by the speed of light c∞. This transformation translates the essential nature of a point into the sets described by eqns. (4-7). This is suggesting that the reality at the layer specified by the speed of light is a function of the reality at the layer specified by the speed of light cK. This transformation combines elements of the sets into unique seeds as suggested by eqn. (9). This is suggesting that the reality at the layer specified by the speed of light is a function of the reality at the layer specified by the speed of light cN. This transformation builds on the unique seeds suggested by eqn. (9) to create the diversity of U as specified by eqn. (1). In this framework the notion of wave-particle duality hence may become complementary block-field-wave-particle quadrality where block refers to phenomenon resident to ∞, field to phenomenon resident to N, wave to phenomenon resident to K, and particle to phenomenon resident to U. Considering quantization to be a phenomenon that relates one layer of light to another in the Light-Matrix, suggests that there are particular kinds of quantization that could occur. The process of quantization itself allows an implicit property or possibility resident at a higher-speed layer of light to project itself without dispersing, into a lower, relatively more ‘material’ layer of light. The materiality can itself be thought of as a result of such quantization. Hence, referring to the Light-Matrix in (10), the kind of quantization that is relevant to the physical layer, U, would relate cU with cx where x ∈ (N, K, ∞), one of the possible speeds of c as per the mathematical model presented in this paper. Such quantization can be represented by hU, where h stands for Planck’s constant. Note that because in this model there are several fundamental quantization possible that may inter-relate a specific light-layer with others above it, for the sake of simplicity it will be assumed that hU is the quanta experienced in the inter-relation between U and the collective-set of light-layers behind or above U. In looking at the Light-Matrix it is also clear that each subsequent layer below the top layer, describing the reality set up by an infinite speed, is emergent. Exploring this concept further, in considering the worlds that are created due to the way light moves or the play of light, we see properties that are projected because of it. In the finite world, the world that results from light traveling at the speed c, there is, relatively, smallness that can be grasped and practically leveraged as a foundation to be further built on. In the infinite world that results from light traveling at an infinite speed there is a vastness and fullness that is difficult to grasp. The notions of time and space are something entirely different in both worlds, and it could be said that Space allows the full play of everything meant by Power, Knowledge, Harmony, and Presence to be seeded in it, and that Time allows that seeding to flower into fuller forms with its passage. In other words both space and time are not just abstract concepts but are essentially highly structured to allow physical-ness, vitality, mentality, and matter to become Presence, Power, Knowledge, and Harmony . Space allows all the possibilities present in Presence, Power, Knowledge, and Harmony and seeded in vast diversity, to evolve into more fullness through the time stages of physical-ness, vital-ness, mental-ness, and beyond. Such a creation of space and time is synonymous with the creation of quanta. Quanta become the means for the possibilities inherent in the anterior worlds of Presence, Power, Knowledge, and Harmony to express themselves in a structured space and time. Quanta are therefore a passage into deeper worlds of Light, and a means for possibilities in these deeper realms to express themselves materially. In this model ‘space’ as an emergent property of Light, is structured by infinite seeds of knowledge. But because the emergence is taking place in a layer of reality generally itself structured by a finite speed of light, c, it has to be quantized. The quantization assures that the knowledge is not dissipated, but can accumulate to create seeds, and therefore, the structure of space itself. It is assumed that there is some kind of ‘Planck’s constant’ in effect, that is modeled as being specific to the way knowledge or space may be quantized – hence, hUK. In this model ‘time’ as an emergent property of Light, is structured by an inevitable process of maturity, which due to its inevitability, is related to power. But because the emergence is taking place in a layer of reality generally itself structured by a finite speed of light, c, it has to be quantized. The quantization assures that the power is not dissipated, but can accumulate to express phased maturity, and therefore, the structure of time itself. It is assumed that there is some kind of ‘Planck’s constant’ in effect, that is modeled as being specific to the way power or time may be quantized – hence, hUP. In this model ‘energy’ as an emergent property of Light, results in the reality of matter. But because the emergence is taking place in a layer of reality generally itself structured by a finite speed of light, c, it has to be quantized. The quantization assures that the energy is not dissipated, but can accumulate to create matter. Planck’s constant is referred to as - hUPr. In this model ‘gravity’ as an emergent property of Light, results in a harmonious collectivity of seemingly independent objects. But because the emergence is taking place in a layer of reality generally itself structured by a finite speed of light, c, it has to be quantized. The quantization assures that the harmony is not dissipated, but can accumulate to express more and more complex collectivities on large-scale. It is assumed that there is some kind of ‘Planck’s constant’ in effect, that is modeled as being specific to the way harmony or gravity may be quantized – hence, hUH. Since quanta hold within themselves the essence of what must be protected from properties or function in higher-velocity light to lower-velocity more-material light, and since the four-fold properties are a representation of the inherent oneness of Light, it is reasonable to expect that such four-foldness will continue to have a bias to uphold that oneness in its more material manifestation. In other words, it is reasonable to expect that space-quanta, time-quanta, energy-quanta, and gravity-quanta related to a single particle will operate as a composite fourfold quantum. This means that four quantum fields operate together or as one composite field in the emergence and possibilities represented by a particle. In fact, as the following examples from different scales of complexity will show, thinking of particles in terms of composite fourfold quanta, allows explanation of phenomena, as well as providing a possible basis for the integration of relativity with quantum theory. These scenarios represent several different circumstances quantum particles may exist in. Figure 1: Composite-Quantum at Atomic-Particle Level. 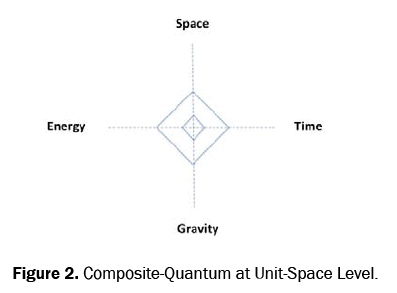 Figure 2: Composite-Quantum at Unit-Space Level. Figure 3: Composite-Quantum at Level of Big-Planet. Note that in eqn. (25), QBP represents a composite-quantum at the level of a Big-Planet, while QUS represents a compositequantum at the unit-space level as modeled by eqn. (24). Eqn. 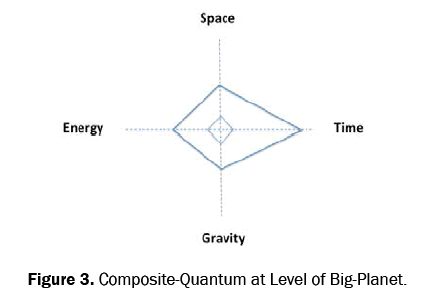 (25) illustrates the notion of composite-quantum as creating the field within which a Big-Planet can materialize. The time-elongation captures the underlying dynamic of many more finite steps to maturity for the vaster collectivity of seeds, that therefore manifests as time being experienced more rapidly: hence time speeds-up. In the application of General Relativity, and primarily due to proximity to greater mass and therefore gravity, time on the contrary is supposed to slow down, relative to a point further from the surface of a planet. These two phenomena hence have contrary effects on time and perhaps suggest a concrete test case to practically experience the effect of a greater collectivity of seeds on time. 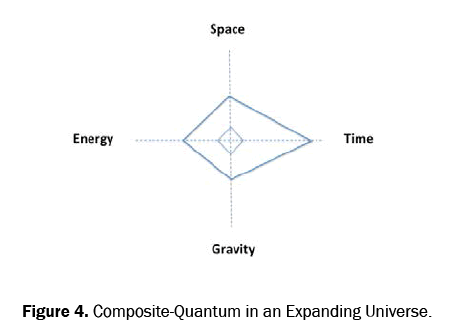 Figure 4: Composite-Quantum in an Expanding Universe. As a particle approaches the speed of light it is in effect approaching the boundary between U and the reality set up by cN. 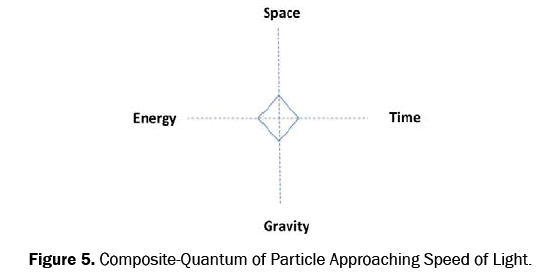 Since space, time, gravity, and energy are emergent and there is a single particle only, the relative structure of these four dimensions should remain unchanged as depicted by Figure 5. Figure 5: Composite-Quantum of Particle Approaching Speed of Light. If there is known to be an increase in the energy and potentially the mass of such a particle that phenomenon is due to the Special Theory of Relativity, and this juxtaposition of contrary effects on the energy of a particle may also prove to provide an arena for the testing of the notion os the composite-quantum being proposed in this article. 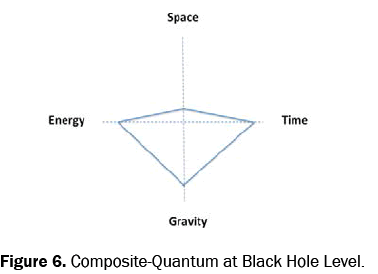 Figure 6, Composite-Quantum at the Black Hole Level, illustrates the relatively different quadrilateral, as compared with previously considered composite-quantum in Figures 1-5. Figure 6: Composite-Quantum at Black Hole Level. This composite-quantum is hypothesized as being the result of a large number of seeds previously spread in space, coming together to be reformulated as a smaller set or a new seed. The new seed(s) have a different intent than the spread out un-mashed seeds, will have a very different and relatively elongated maturity-dynamic as depicted along the time-dimension, will have a very different collectivity-relationship between other seeds as represented by the gravity-dimension, and will similarly also have a very different energy-materialization dynamic as represented by the energy-dimension. Note that consistent with General Relativity, the dynamic of gravity intensifies, space is compressed, time slows down, and energy-potential increases. 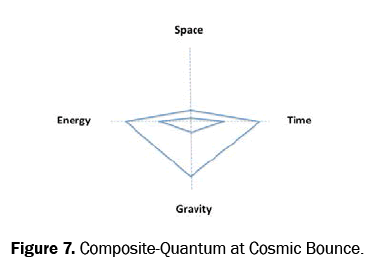 Figure 7: Composite-Quantum at Cosmic Bounce. This article suggests that quanta are a result of light slowing down from some native speed to c. This allows the materialization of properties inherent to Light. Further, space, time, gravity, and energy are themselves seen as emergent from Light and as being constructs related to the seeds so created to materialize the immense possibility and information inherent in Light. It is proposed that there is a composite space-time-gravity-energy quantum that may alter in certain circumstances. In this article such circumstances that alter the relative proportions of the four dimensions are a Big Planet scenario, a Black Hole scenario, and a Cosmic Bounce scenario. It is further proposed that the Big Planet scenario has a different effect on time than General Relativity, and finding different situations with involve higher planet mass with a different range of seeds may provide a possible proof for a part of the thesis presented here. Similarly the Particle Approaching c scenario predicts contrary effects on the energy associated with a particle and may also provide grounds for a proof for part of the thesis presented here. Table 1. Projections of Light’s Fourfold Properties at Different Levels. It therefore may be possible to see a variation in the relative percentages of the four properties in the various scenarios suggested in the section on the composite quantum. Specifically, in a Big Planet scenario where it is proposed that time is elongated, perhaps manifestations of the property related to Power may increase. Similarly at the level of a Black Hole manifestations of the property related to Knowledge may decrease relative to other possible manifestations. This article represents a concept only and further exploration will need to be conducted to determine if in fact there are different kinds of quantization. Further possible integration of such a fourfold quantization scheme will need to be attempted on such fundamental models as Dirac’s quantum mechanical model. The implications and possible integration of relativity with quantum theory will also need to be attempted based on the notion of a composite fourfold space-time-gravity-energy quantum. Malik P. Cosmology of Light. Bowker: San Bernadino 2018. Isaacson W. Einstein: His Life and Universe. Simon and Schuster: New York, 2008. Lorentz HA. The Science of Nature. Springer, 1925. Malik P. Connecting Inner Power with Global Change: The Fractal Ladder. Sage Publications: New Delhi, 2009. Feynman R. QED the Strange Theory of Light and Matter. Princeton University Press: New Jersey, 1985. Broglie L. The Wave Nature of the Electron 2018. Ekspong G. The Dual Nature of Light as Reflected in the Nobel Archives 2018. Wilczek F. A Beautiful Question: Finding Nature’s Deep Design. Penguin Books: New York, 2016. Perkowitz S. Slow Light. Imperial College Press: London, 2011. Whitaker A. Einstein B. From Quantum Theory to Quantum Information. Cambridge University Press: Cambridge. 2006. Malik P, Pretorius L. Symmetries of Light and Emergence of Matter. Indian Journal of Science and Technology 11: 2018. Einstein A. Relativity: The Special and General Theory. Broadway Books: New York, 1995. John GW, Black Holes, and Quantum Foam: A Life in Physics, W. W. Norton & Company. 2000.